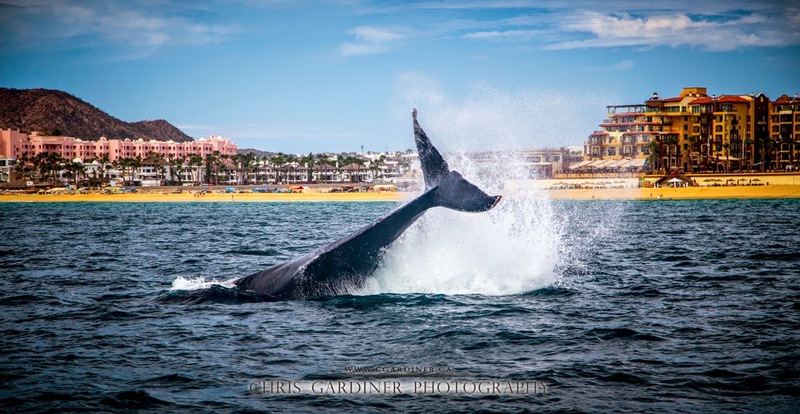 I want you to learn from my mistakes - if you go to Cabo San Lucas during whale watching season, most definitely bring yourself a telephoto lens! I was already at my quota of photo gear to pack into the country for the equipment I needed to use to photograph the wedding, so I didn't risk any issues with customs/immigration. And if it were an option, I'd have rented a lens down there, but.. it wasn't. To be honest, I didn't even know I was going to go on a whale watching tour in Mexico before we got down there, which makes planning for it kind of difficult. Read more to find out which of the plethora of whale watching tours we chose, and another photo. When you get down there, it becomes apparent that whale watching is a major element of the tourism component. I recommend going on a larger craft. Having grown up in Banff National Park, one thing becomes engrained in you - don't approach the wildlife, not just for safety reasons like this, but out of respect for the wildlife, So the good thing about the large boats is there are rules in place that keep them at what has been determined to be a safe distance away from the animals - coincidentally, a telephoto distance. But at least you can feel a little better about not getting all up in the whales' business. We chose EcoCat Catamaran Tours. As far as time out on the water, it was one of the longest tours, it also was on a giant catamaran with washrooms and included alcoholic beverages (even though we started at 930am haha). The Whale Watching tour also included a trip around El Arco (the other major tourist sight to see in the area) and food at the EcoBar on the marina. The staff and crew were professional and more importantly, extremely entertaining and I would recommend anyone visiting the area to take their tour over another. There were about 30 people on our boat tour which allowed us to walk around the craft freely. It was quite empty. After walking around the marina, we saw the next tour loading up which was two to three times more people - if you are going to capture photos, this will definitely make it harder for you. So keep that in mind. Our crew spotted a pod consisting of momma, poppa and a newborn calf which they estimated to be no more than 10 days old. Whale watching is best done in the morning when they are most active, and also when the water is the calmest.